First of all you need some gear. These days you can make hip hop beats using your laptop, ipad, iphone or a stand alone beat making unit such as the AKAI MPC range. Ideally you'll use a combination of a computer based sequencer/DAW and a beat pad like an MPC or one of the cool new Akai controllers for Ableton Live. There are many DAW apps to choose from, we like Ableton. If your going to buy an MPC choose one that has the specs you need for the amount you can afford. These are sought after gadgets so you can easily trade up later if you need more power. Next you'll need some samples so check out www.platinumloops.com for a massive selection of loops and samples in a wide variety of genres. 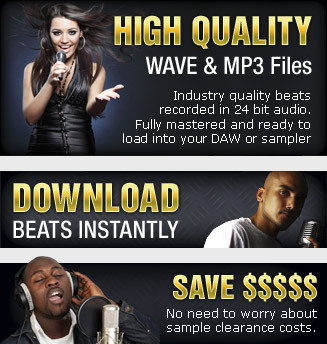 You can also sample sounds from your favourite CD's and records but be aware that you'll face sample clearance costs later if you ever want to sell or license your beat. Some copyright holders may not even want to license a sample for any amount of money so sample at your own risk. Once you've got sorted with all your gear and apps it's time to have some fun making the beats. There are no rules but I like to start with a hook sample, something that sparks my interest and makes me want to build a drum groove around it. For example, this arabic loop from Platinumloops is an instant inspiration and I know I can easily build a fat beat around this idea. Download WAVE here. I'll load this into Ableton and assign it to my beat pad or keyboard controller so i can trigger the sample. I can also choose to chop up the sample into smaller sections so that I get more control over the groove. After a few minutes of playing around with the groove I'll record my idea into Ableton. Next I load up some cool drum sounds to an Impulse kit in Ableton and lay down a fat drum beat. Now we have the foundation for a cool beat. The next stages are to add extra elements to the beat without it getting too busy. Leave plenty of room in certain areas so that a rapper or singer can make it their own. Verses should always have lots of space for vocals. To see these and other techniques in action check out some of these Beat making videos by Youtube broadcasters on this page. If you've got Beats that you think we ought to be selling please get in touch via our contact form. These Youtube videos show you how to use various techniques to make your own beats. Check out the contributors channels and susbcribe to their feed to get their latest videos.